Custom machined ultra light Aluminum Stoptail Piece US Retrofit for solidbody guitars. 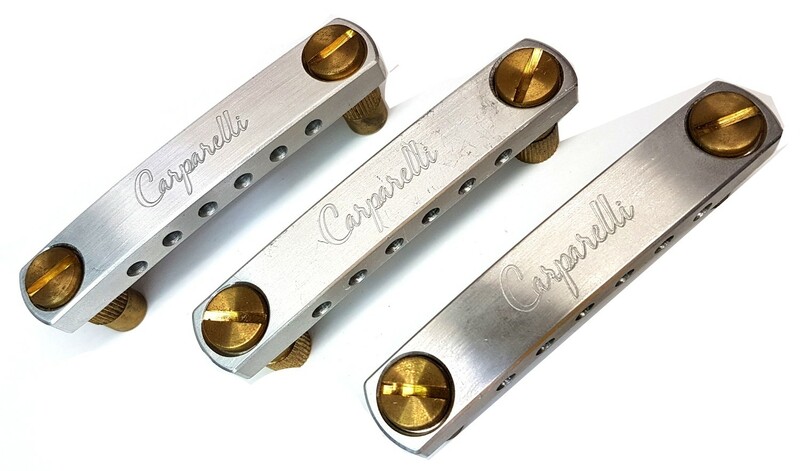 Includes height-adjustable U.S. (5/16-24) brass threaded mounting studs and knurled bushings. The mounting studs are spaced 3-1/4" (82.55mm) center-to-center. Custom machined ultra light Aluminum Bridge and Brass Saddles US Retrofit. With a 2.906 (73.82mm) stud spacing from center to center. Same as US Les Paul Size. The Bridge also has a 12 Radius matching the Stop Tail Piece. Brass Thumbwheel height-adjustment studs and knurled bushings are included.